The Academy of the Sacred Heart and the Rosary Sacred Heart Alumnae Association are pleased to announce Sallie Tillman Rainer '79 as the inaugural recipient of the Mother Anna Shannon, RSCJ Award. This award recognizes an individual who is devoted to her faith, is diligent in her work, has compassion toward others, possesses a winning personality, uses tact in all situations, and is courageous. Sallie Tillman Rainer '79 serves as President and Chief Executive Officer of Entergy Texas, Inc., an electric utility that serves more than 450,000 customers in 27 Southeast Texas counties. She is responsible for the company's electric distribution system, customer service, economic development, regulatory and governmental affairs, as well as the company's financial performance. 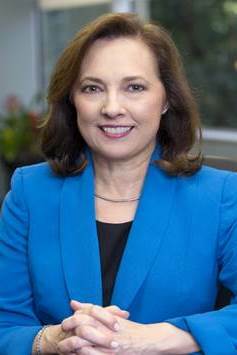 Prior to this role, Rainer served as Vice President, Federal Policy, where she advised Entergy's regulated utility companies around federal policy issues and led the company's effort to join the Midcontinent Independent System Operator (MISO), a move that resulted in greater reliability and savings for its customers. Since beginning at Entergy Corporation in 1984, Rainer has held roles in regulatory strategy and resource planning to ensure reliable and affordable supply of energy for customers. She held various management roles in long-term system planning before being promoted to Director of Regulatory Affairs and Energy Settlements. Rainer currently serves as a member of the Board of Directors for Interfaith of The Woodlands, Lone Star College Foundation, and the Greater Houston Women's Chamber of Commerce. She is also a member of the Leukemia and Lymphoma Society Light the Night Executive Committee, United Way of Greater Houston Montgomery County Regional Council, and the Texas Children's Hospital Ambassadors and Leadership Cabinet. She also serves on the Texas A&M University Engineering Advisory Board. Rainer holds a bachelor's degree in engineering technology from Louisiana State University and a Master of Business Administration from Texas A&M University. What does it mean to you to be recognized as the first Mother Shannon Changemaker Award recipient? I was honored that I was even considered for the award. To be recognized by the school and fellow alumnae for such an award is a humbling experience. To be the first to receive this award certainly makes it even more special to me. Sacred Heart is home to me. I always considered Sacred Heart to be a safe place to grow and learn. It is the place where I not only developed an appreciation for education, but learned how to build relationships for being a successful leader. Sacred Heart really set the foundation for who I am. That foundation enabled me to grow and ultimately led to my success from both a professional and personal perspective. The students at Sacred Heart are highly committed. Being around others who are driven to achieve certainly drove me to work hard and challenge myself. The support of great teachers and fellow students set an academic foundation to be successful in college. However, to really be successful professionally, it takes much more than academic accomplishments. That is where I see my Sacred Heart education helped me the most. Being successful professionally also requires the ability to build relationships, communicate effectively, and lead others. All of these characteristics were developed during my time at Sacred Heart and really are key components to my professional achievements today. During my time at Sacred Heart I certainly developed an appreciation for caring for others, especially those less fortunate or those suffering. That sense of community and the calling to serve others has been something I have carried with me throughout my career. In my current role at Entergy, I have the opportunity to practice those teachings to help a large number of people. My involvement on non-profit boards and fundraising, including the United Way of Greater Houston, Greater Houston Women's Chamber of Commerce, and the Leukemia Lymphoma Society of the Texas Gulf Coast, has been such a rewarding part of my career. As the leader of an electric utility, I see the importance of corporations supporting the communities they serve to help communities address topics of poverty, education, and environmental stewardship. I am proud to work for a company like Entergy that does so much to support the communities in which we live and serve. I have so many great memories of my years at Sacred Heart—it is hard to pick just one. One thing that comes to mind isn't just a memory, but it's the many deep and long lasting friendships that I built at Sacred Heart. In addition to the memories while we were in school, our relationships continue today. I, of course, also had some favorite teachers. One teacher, Mrs. Kiefer, our biology teacher, got me interested in science and had a hand in leading me into the engineering field in college. As for the many events at Sacred Heart, one of my favorites was always Rally Night. Our class, the Stars, always had so much fun preparing for and participating in the event. Our class had lots of spirit, so that event was very special memory.